The Activator Method is a Chiropractic technique that has been around since the 1960’s, and is still utilized by Chiropractors world wide. With the Activator there is no awkward twisting, bending, or cracking. The simple and painless process will allow us to analyze your bones, nervous system, and muscles, while performing a gentle adjustment. The reason the Activator Method is so effective is the speed and precision of the adjustment. 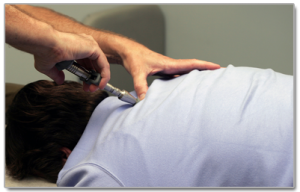 The Activator delivers a gentle thrust directly to the subluxated area, which allows much less force than other types of Chiropractic adjustment. The best part about the Activator method is that the patient will feel no discomfort. There is no need for sitting up, bending over, turning your head, so all you have to do is sit back and relax! Call us today and receive the gentle Chiropractic care your body deserves.